Information enters organizations in a number of ways- paper, fax and electronic-so a comprehensive capture system must accommodate documents regardless of their format. When integrating documents into existing business process workflows, a scalable capture platform built on an open architecture ensures compatibility between existing hardware devices, relational databases, content management systems and related network infrastructures.
. Faster, more reliable decision making. 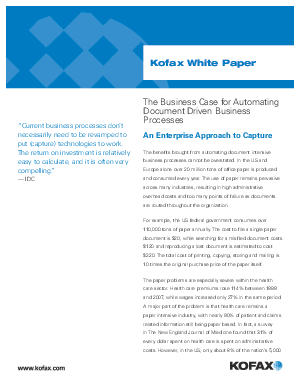 Document intensive business processes are much more efficient in an environment of front and back office symbiosis. An enterprise approach to capture results in lower costs, better document security, increased productivity, improved customer relations, simplified regulatory compliance and faster exception processing. Enterprise capture is a compelling investment that offers a demonstrable ROI that's relatively easy to calculate.